Moisturizing before makeup is a must to give your skin the best glow and softest skin you can have and to lay down the best canvas to prepare your skin for makeup. 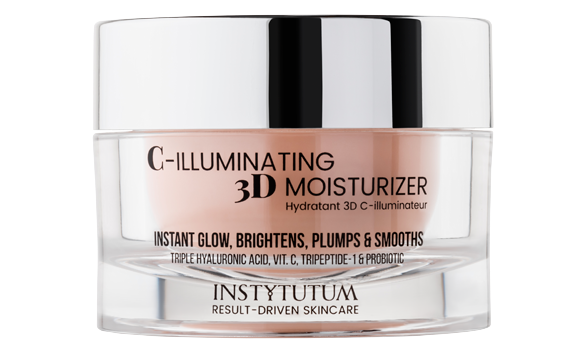 For an amazing immediate illuminating glow and a supple, plump healthy and intensely hydrated radiant skin, try INSTYTUTUM C-Illuminating 3D Moisturizer. This super-charged anti-aging formula is a multi-tasking formula and has many benefits too. The innovative texture will help blur imperfections, enhance your glow and reflect light off of your complexion. This moisturizer is perfect for an amazing immediate radiant glow and a supple, plump, healthy and intensely hydrated glowing skin. This super packed anti-aging formula combines Vitamin C for brightening, reducing hyperpigmentation, stimulating collagen and increasing elasticity. The multi-molecular hyaluronic acid complex helps provide for multi-depth hydration. It contains low, medium and high-molecular-weight hyaluronic acid for excellent hydration and it rapidly penetrates skin to create a protective film on the skin's surface, reduces water loss from the inside, provides 24 hr moisturization, nourishes the skin's surface, repairs and restores from the inside and provides anti-pollution/anti-UV benefits. Tri-Peptide-1 is an anti-aging ingredient that encourages skin renewal and stimulates collagen synthesis to reduce wrinkles and sagging skin. Probiotics help stabilize and create a healthy natural skin barrier. Pomegranate extract provides anti-aging and moisturizing. Beet Root Extract is for instant and long-term moisture as well as supporting the natural moisturizing (NMF) factors. Shea Butter, Almond and Jojoba Oil, Allantoin, Vitamin E, ProVitamin B5 (niacinamide) as well as Polysaccharides are included for anti-inflammatory, smoothing, calming, soothing, softening, repairing, protecting and moisturizing properties. This product can be used alone for a natural luminous finish or to enhance your makeup with a pearlescent glow. To use, apply evenly to a perfectly clean face and your skin will instantly look radiant or use as a perfect makeup base for that extra glow. Make sure to use a sunscreen of at least a SPF30 or more when using this product during the daytime otherwise you will be undoing all of the wonderful things this product does for your skin. This product is an anti-aging powerhouse and sunscreen is the number one way to prevent aging skin. I love this cream. It truly does provide a great glow to the skin and is great as a makeup base. In this picture I did not use a sunscreen over it because the foundation I was using had a SPF50 in it and was full coverage. You can see how it gives the skin a nice glow to it and makes it look almost pearlescent. It provides light to the skin, so that there are not many shadows. Vitamin C helps to brighten, so that not only are you getting a cream to moisturize and help the skin glow, but over time this cream will help lighten up hyperpigmentation too. All of the different weights of hyaluronic acid in this cream will help to provide intense moisture to the skin. Believe me, this will not let your skin feel dry. This kind of cream is best suited to skins that are mature, dry, normal and combination. I would not recommend it for oily or acneic skins. I would definitely recommend it for mature and dry skins. I think that those with mature and dry skins would benefit the most from the anti-aging ingredients and what the cream does for the skin. INSTYTUTUM C-Illuminating 3D Moisturizer retails for $55.00 and can be found online at www.instytutum.com or salons where these products are sold. It is recommended you see an Esthetician to see what products are best for your skin. Like INSTYTUTUM on Facebook: https://www.facebook.com/Instytutum/; Follow INSTYTUTUM on Twitter: @instytutum; Follow INSTYTUTUM on Pinterest: https://www.pinterest.com/instytutum/; Follow INSTYTUTUM on Instagram: https://www.instagram.com/instytutum/ and Subscribe to INSTYTUTUM on YouTube: https://www.youtube.com/instytutum.